These Loaded Reuben Fries are loaded with chopped corned beef and sauerkraut topped with lots of melted swiss cheese and drizzled with creamy Russian dressing. One thing I love about St. Patrick’s Day is the food! I always look forward to making corned beef and cabbage. I also love a hearty Irish stew. It reminds me of my trip to Ireland many years ago. I loved Ireland. It’s truly a beautiful country with rolling hills, hidden streams and beautiful scenery. It’s definitely one country I look forward to visiting again. 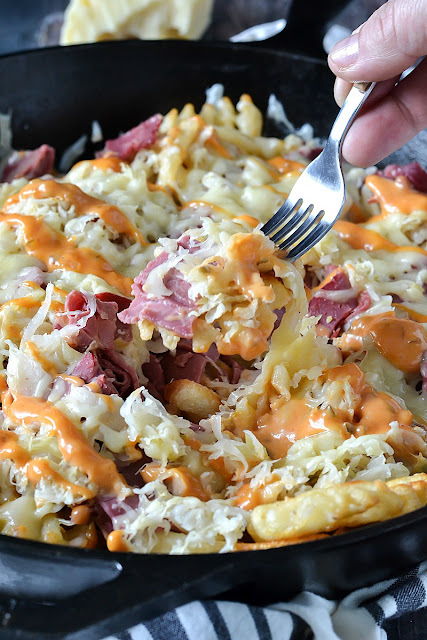 These Loaded Reuben Fries are loaded with chopped corned beef and sauerkraut topped with lots of melted cheese and drizzled with Russian or thousand island dressing. I like to serve them in a cast iron skillet or you could even use a sheet pan. These loaded fries are perfect for St. Patty’s Day or any day you’re craving a reuben and fries! Spread fries on a single layer on a large baking sheet and bake for about 25 minutes flipping half way through until golden brown. Sprinkle corned beef, sauerkraut and cheese on top of fries. If you'd like you can also transfer fries after they are baked into a cast iron skillet. Add the topping and bake until cheese is melted. 0 Response to "LOADED REUBEN FRIES"